While I continue with yoga class every morning to improve my alignment, Oma’s alignment has gotten way out of whack. No, it has nothing to do with stuffing her pannier full of Chipotle and wine. One unfortunate event caused her current crooked state. On Sunday, I stood Oma up on a grassy area in the park. Due to rain the night before, the ground was saturated and soon Oma toppled and fell on her side with a crash. I think this was the first time she has ever fallen like that, since her double-footed kickstand is super heavy-duty. See how the handlebars are squared to the front, but the wheel is tilted to the right? And how the wheel is pointing straight to the front, but the handlebars are off to the side? And this morning I noticed that my pedals are out of alignment. The right side is pushed way in and the left side is sticking way out. Funny enough, Oma continues to ride pretty normally. Knowing me, I could continue riding her like this for at least a year or two, but I’m determined to fix this problem in a respectable timeframe. But this is not like when Betty Foy falls and knocks her fenders out of line – that’s a problem I can fix easily and quickly. Oma’s solidness is a double-edged sword. She refuses to budge from this new position. I attempted in vain today to kick the pedals and push the handlebars back in line. I suppose I will enlist Mr. Dottie’s help in the morning or just drop Oma off at the bike doctor in the afternoon. Has your bike ever gotten out of line? If so, how did you fix it? All right folks, it’s another evening and another drawing/roundup of this year’s Summer Games winners. Every day this week through Friday, we will be posting a round-up of LGRAB 2011 Summer Games players and announcing the lucky prize winners. Winners will be randomly drawn from the entire pool of players. I picked up this kids book about the history of women and bicycles from the library several months ago and I keep renewing it without reading it. The Summer Games changed that. Actually, this book might have been recommended by one of you: Wheels of Change: How Women Rode the Bicycle to Freedom (With a Few Flat Tires Along the Way). It was interesting, but I would have liked more about the impact of bicycles on women’s day to day lives, and less on famous lady bike racers. She performed a maintenance task–an impressive one if you ask me! I accidentally did the same maintenance task for this year’s Summer Games as I did last year: Repacking a hub. I’m still not very good at it. If I’d planned ahead I could have counted many other things, since this summer I took an 8 week bike workshop through Common Cycle, and we learned everything from raising saddles to replacing cables and housing to headset adjustment. But I didn’t take pictures any of those weeks. I waited til the very last week, when we were doing hubs and wheel truing. Here’s the picture I attempted to take of myself; it was hard because my hands were covered in grease and all I had was my phone. Molly also went on a group ride on her birthday (happy birthday Molly!) and took this lovely summer-themed photo. We need to do a flikr pool of these for us to pine over when we’re stuck in the depths of winter once again. 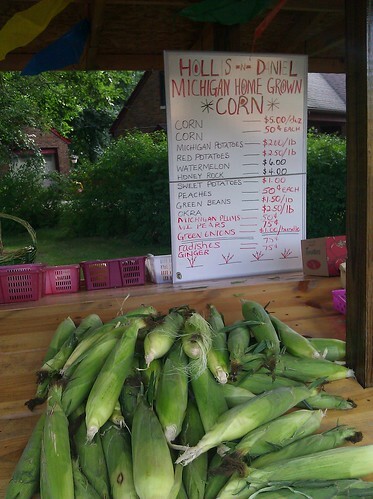 Mm, sweet corn. She also took a new road home and performed a maintenance task: replacing the old pump and bottle cage on her bike with a new, more coordinated one. And she snapped a photo that is the perfect combo of summer and bikes. I love it! One of the best things about having a bike blog is having all sorts of cool people contact you to say that you’ve inspired them to create their own blog. :) Kathy in Chicago is among that number and you can read about her adventures in multi-modal commuting at Train-Bike Bike-Train. Kathy test-rode a cargo bike and videoed the results—click on the photo to see the video. She also wrote a letter to Metra suggesting improvements for multi-modal commuters, gave her bike tires a lift and took some stellar summer pictures. JoAnna rediscovered cycling a year ago when she was in Paris and hasn’t looked back (a woman after our own hearts!). For the Games, she completed seven tasks: riding a bike on vacation, writing a letter, reading a book, cleaning her chain, riding on a greenway and participating in New York’s Summer Streets. Martina at The Life Academic knocked out quite a few tasks in a single afternoon. She tuned up her bike and went out for a ride, ending up in a new part of town and discovering a new friend along the way. How have I never realized that my favorite droid has been waving to me all summer long as I biked to and from work? I honestly couldn’t be happier to have met this new friend. Isn’t it just the summeriest, happiest thing, to have droid along your ride? Yvonne, aka The Knot Whisperer, also got in on the fun. She very responsibly biked to jury duty, making me horribly jealous because, oddly, I have always wanted to be chosen for jury duty and somehow have gone 12 years without being tapped (yes, I know it will probably be boring. I still want to be picked for the team!). She read The Lost Cyclist, a fascinating true tale of a man who biked around the world back in the late 1800s. I couldn’t help putting myself in Lenz’s place as he traveled through Japan and China without speaking a word of those countries’ languages. While it’s true that I went to St. Petersburg, Russia, without knowing a word of Russian, I went there as part of a writing seminar and was therefore hardly on my own. I can’t imagine how frightening it must have been for him, all on his own, especially back then when foreign countries were truly foreign to most people. She wrote asking for improvements to the Ashland/Armitage/Elston intersection, aka the “Intersection of Terror.” And she rode a cruiser on vacation! Sweet. OK, now that you’re all inspired: it’s time to reveal the winners, drawn by Dot. First up: Bates Crate Porter Crate, a beautiful, functional, handmade carrying crate for your bike. It goes to . . . Kathy F, whose adventures were featured above. Our second drawing is for a Workcycles apron. And the winner is . . . Stacy Bisker! Kathy and Stacy, we will be in touch with information on how to claim your prizes. Not a winner yet? Keep checking daily, because we still have several great prizes to give away.